AH reader and photo collector Norm Gholston recently sent along this amazing photo from 1929, so we’ve enjoyed doing some of our favorite photo detective work. Have a good look first and we’ll take it apart to learn a bit more about Wrenn Auto Delivery. The Wrenn Auto Delivery team in front of company offices on N. Tillamook near Interstate. Photo courtesy of Norm Gholston. Click to enlarge. First things first: Wrenn Auto Delivery is not a company that delivers autos. They were essentially an around-town trucking firm. The name “auto delivery” was an artifact of the horse-drawn earlier days when it was a novelty to have something other than a horse and carriage deliver goods. When the company started out just four years after the Broadway Bridge was built, it was a major innovation (and quicker) to have an automobile deliver your load of heavy wax paper or whatever you might be needing. To our eye, it looks like this photo has been touched up a bit, though the sparkling chrome on the Mack truck at far right looks completely genuine. The labels “Western Wax”—referring to the Western Wax Paper Company, a major customer of Wrenn’s in 1929—have been penciled in, and the hood of the Mack on the far left looks like it’s been doctored (nice fingerprint there too, which gives us a clue about the size of the original photo). But everything else looks authentic, including the surly looking dog in the middle truck. 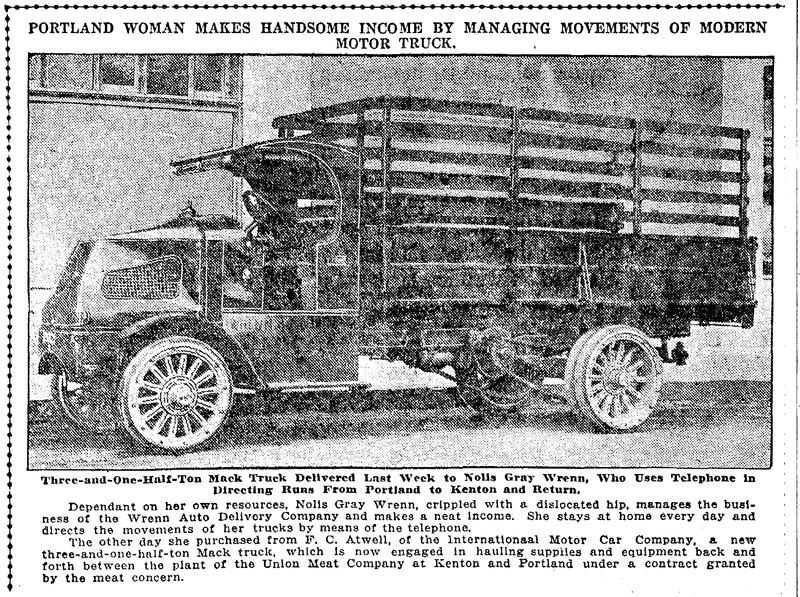 Wrenn Auto Delivery was started in about 1916 by Nolia Gray Wrenn and her three stepsons Moultrie, Grover and Ashby. The rise of autos—and relationships the family had with various industry sectors—probably spurred the start, combined with the family’s economic necessity. Samuel E. Wrenn, Nolia’s husband and the boys’ father, died unexpectedly in 1915 following a career in the lumber and wooden box industry. From The Oregonian, March 25, 1917. Click to enlarge. During the first few years, the company operated out of the family home near NW 22nd and Johnson, but by the mid 1920s Nolia had moved to the Paramount Apartments at 253 N. Broadway and the business headquarters was a garage and warehouse near today’s N. Tillamook and Interstate. In 1933, the family launched something they called Wrenn’s Auto Laundry…an early car wash for trucks and cars? Advertisements for the company during those years referred to 155 N. Tillamook, which after great renumbering translates roughly to today’s 687 N. Tillamook. Building landmarks are hard to discern in the 1929 photo (awnings, big doorways, windows, ivy), but after much looking we think we came pretty close with this view. 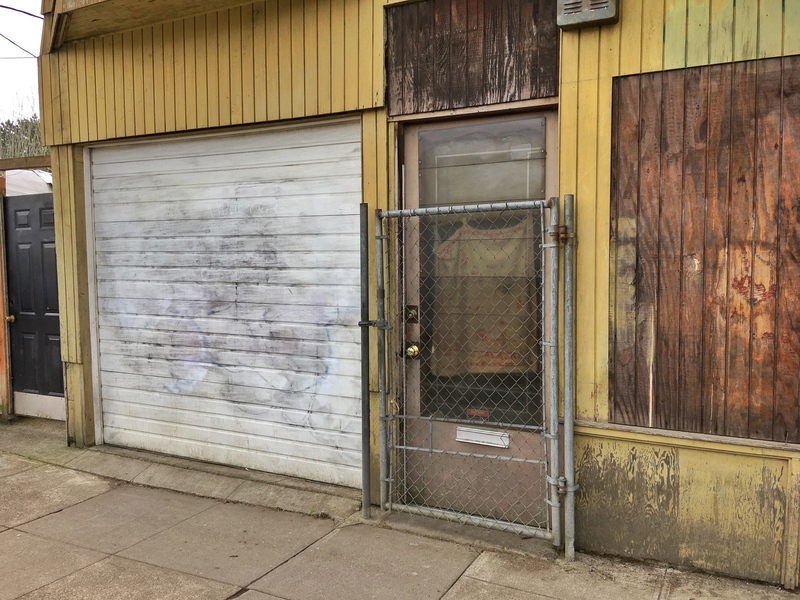 The 600 block of North Tillamook, former home of Wrenn Auto Delivery. January 2018. Nolia died in September 1952. By the mid 1970s when the trail of the business goes cold, it was operating out of the Mt. Scott area in southeast Portland. Can you tell us more about Wrenn Auto Delivery or these three great delivery trucks and their smiling drivers? NE 33rd and Broadway, 1930. Wow. Every once in a while a photograph comes along that completely pulls you in with so many stories to tell. Here’s one you’re going to want to spend some time with. We were at City of Portland Archives this week researching a piece we’re writing about the 1929-1930 widening of East Broadway, which completely transformed what was a sleepy street into the major arterial we know today between the Broadway Bridge and Sandy Boulevard. It’s a fascinating, sad, complicated, inevitable story that we think you’re going to enjoy reading about. In the process, we ran into this picture of an intersection many of us know well, anchored by a building we’ve written a lot about. There is so much to see in this photo: you’re going to want to click to enlarge it and climb inside to see all there is to know. Looking east on Broadway at the corner of NE 33rd. Photo courtesy of City of Portland (OR) Archives, image A1999-004.326. 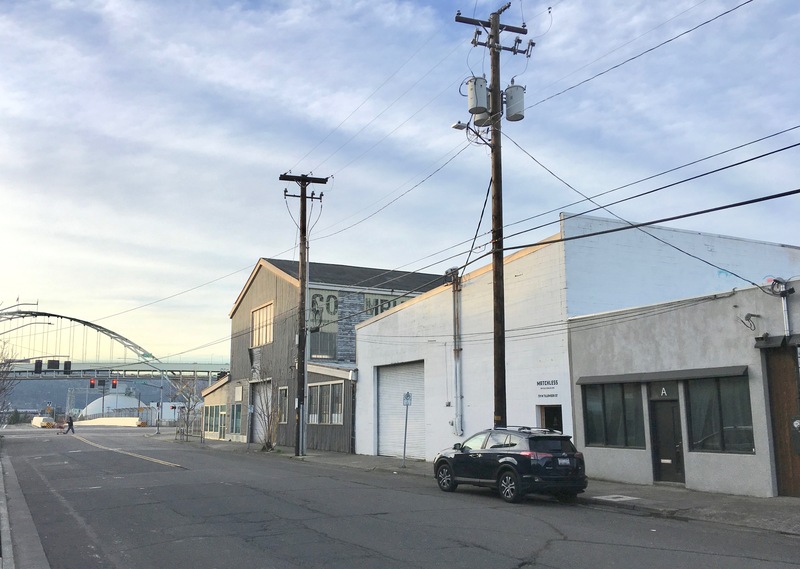 The main building on the right was built by Oregon Home Builders in 1916 and served briefly as a manufacturing site for aircraft parts during World War 1. You can read more about that here and see some other photos of the building and the intersection from a different angle. The tallest portion of that building is actually a freight elevator (which we’ve had a chance to ride in…the largest freight elevator in Portland, or so it was explained to us). Painted on the exterior of the elevator tower is an advertisement for wholesale hardwood flooring. The building continues quite a ways east into what is a parking lot today. Looks like heavy storage was popular even then: a banner advertises heated space with trackage (the rail runs just the other side of the building). And how about the grocery, beauty parlor and even a cafe in the first floor retail space. Who knew? The Texaco on the left is still a filling station. And see the billboard at the far end of the street advertising the Hollywood Theater? On the north side of the street, the Frank L. McGuire company has a bungalow for sale. 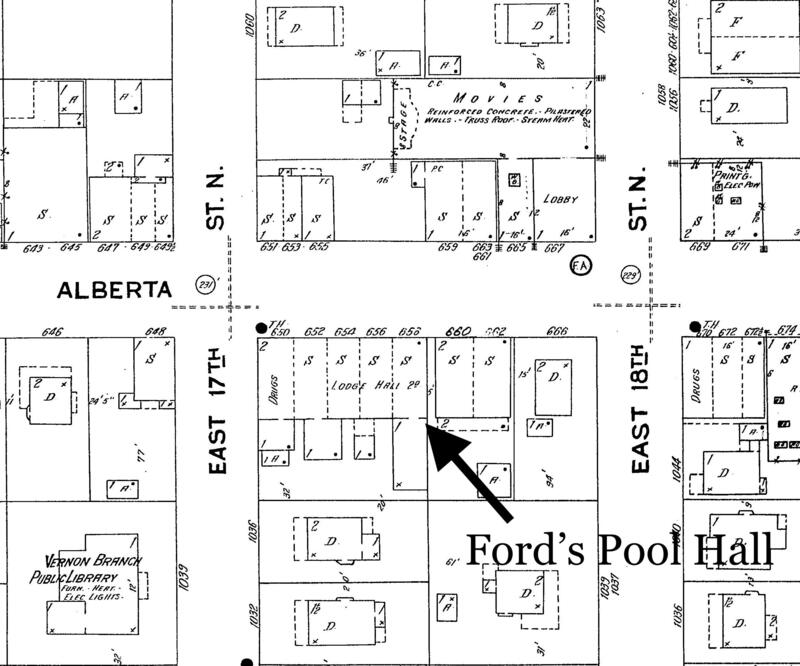 This week our full attention has been drawn to learning more about the area around NE 17th and Alberta during the period of the 19-teens, sparked by our hunt for Ford’s Pool Hall pictured in a recent vintage photo. But we’ve come across another photo and more about that block and the people who knew it during those years. At the back of Gabel & Son Bakery, formerly 662 Alberta, today’s 1726 NE Alberta, about 1909. Click to enlarge. Used by permission of the Gholston Collection. That pile of wood fired the bakery’s ovens. Looks to us like the shed-roofed enclosure on the side wall of the pool hall may have been a woodshed (see the ax just inside the door leaning up against the wall?). Did those white bags on the ground contain flour? See the damper control rod coming up through the other shed roof under the stairs connecting to the stovepipe to manage oven heat? How about the exposed knob and tube wiring bringing power to both buildings. The more we’ve looked at and thought about this photograph—and have done some digging—we realized it shows the backside of that block of buildings. That means the one-story clapboard building with the two square windows, behind the wagon, is Ford’s Pool Hall, and the building with the stairs going up to the second floor apartment housed Gabel & Son Bakery, today’s Earl’s Barbershop. Detail from Sanborn Fire Insurance Map Plate 550, 1924. Here’s a contemporary view of that same scene in just about the same place. 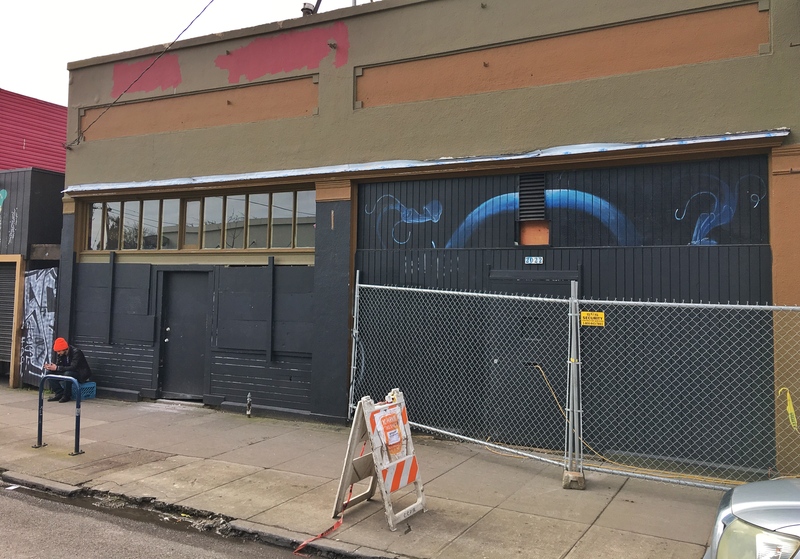 We looked closely: not many clues about the former one-story pool hall, or really anything prior to the major remodeling done on these buildings in recent years. Behind 1726 NE Alberta, about the same view as the early Gabel & Son Bakery delivery wagon photo. November 2018. This great old photo made us wonder other things too, like who were Gabel and his sons? Who lived upstairs “we live up here.” What happened to the pool hall part of the building? AH readers know we like questions like these. Gabel was George A. Gabel, born in Germany in 1845. He and his wife Mary and their five children came to Portland from Michigan’s Upper Peninsula in the early 1900s. He was a shoemaker by trade, but also ran a small farm with the help of sons George Jr., and Henry. 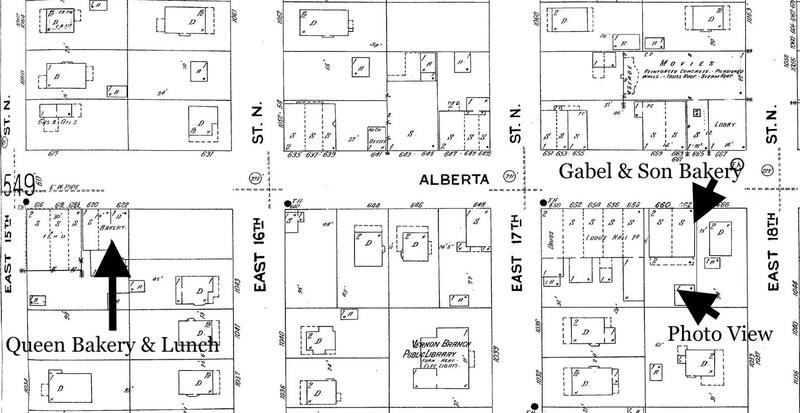 When they came to Portland the family established the Gabel & Sons Bakery which operated at 662 Alberta (1726 NE Alberta) from 1909 til about 1916 when George Sr. opened a shoe repair business just up the street. Son Henry took over the bakery business, opening a popular lunch spot at NE 15th and Alberta called the Queen Bakery and Lunch, which was a one-story old frame shopfront that occupied the space that is currently the parking lot just east of today’s Alberta Food Co-op. More on that in a moment. 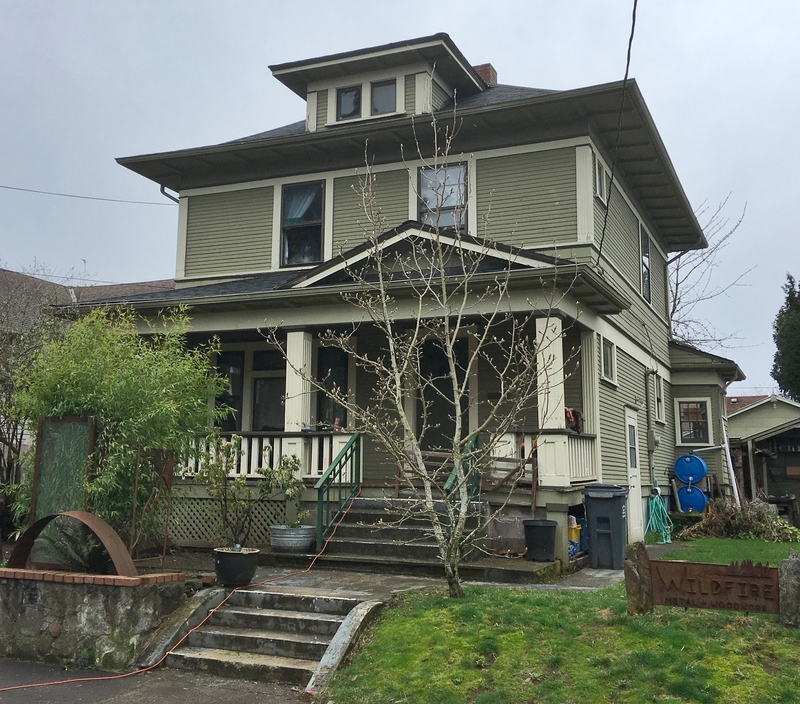 The Gabel clan lived two blocks north in a big four-square on NE 16th Avenue, but son Henry, who was 27 in 1910, with wife Nellie and young son Clyde, were out on their own living at 662 ½ Alberta, which was the apartment upstairs from the bakery. That must be Henry or Nellie’s handwriting on the photo: we live up here. 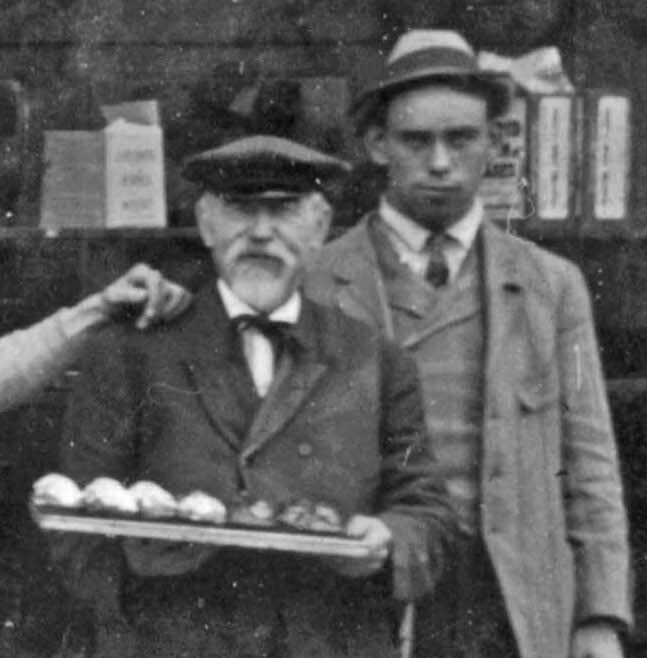 As we learned more about the Gabels, we wondered could the “muffin man” in the pool hall picture standing next to George Ford—the older gent with goatee, cap and bowtie—be George Gabel? In 1909 he was 64 years old. Possible. For that matter, the young man standing behind might be his son Henry, or maybe Albert. Detail from Ford Pool Hall photo. Is this George Gabel and his son? Our hunch is yes. 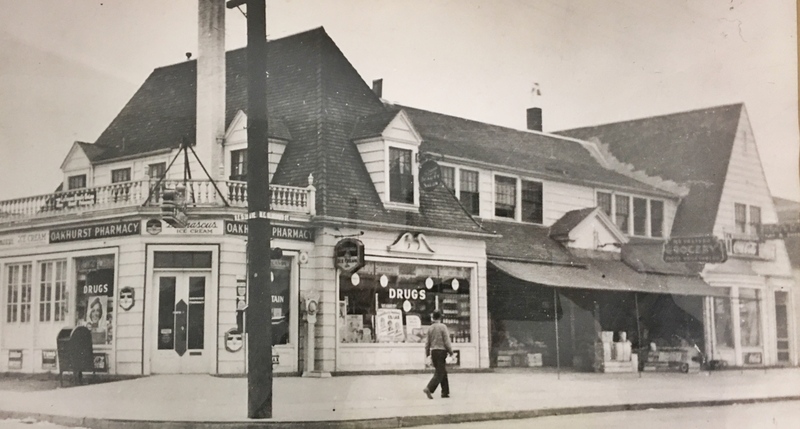 The Gabels were well-known and reputable business people and the family was connected with the Alberta Street area well into the 1950s (Henry retired in 1953). But most people of that generation would probably remember the family for actions of middle son Albert F. Gabel. 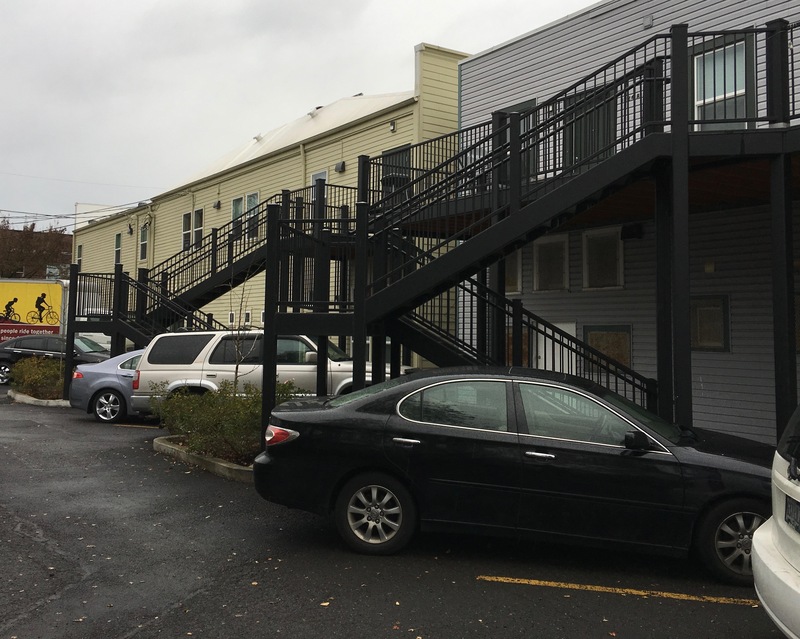 This is where the story gets a bit sinister, and we realize we’re going down the rabbit hole a bit chasing this, but it is interesting and allowed us to turn up another photo of this section of Alberta Street, so bear with us. 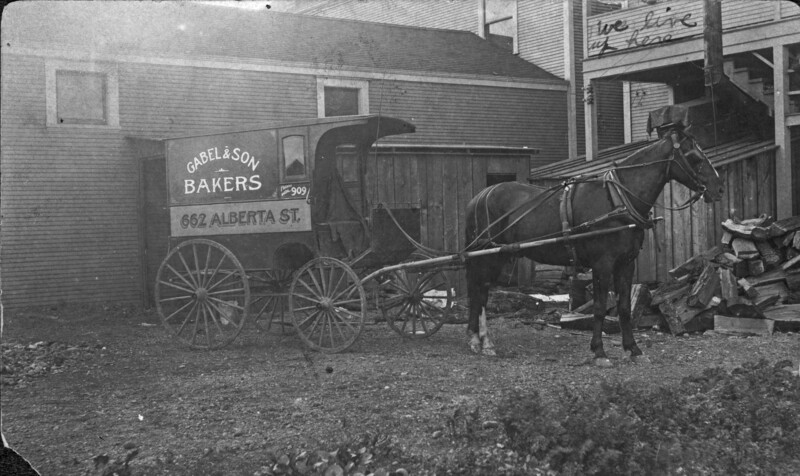 Albert drove a bakery delivery wagon for his father and his brother Henry, perhaps the wagon pictured here. In January 1916 Albert, then age 24, was involved in what investigators determined was an accidental shooting of his girlfriend, Minnie Lee. It’s a long, sad story that we won’t go into except to say that Albert had become obsessed with Minnie—who at that time was separated from her husband. During what Albert described as horseplay, a rifle discharged, the bullet striking and killing Minnie. Initial news reports (and Minnie’s family) called it murder, but the DA backed off to a charge of involuntary manslaughter on the basis of evidence, and Albert was set free on bond to await trial and went back to driving the bakery delivery wagon. By 1916, brother Henry had opened Queen Bakery and Lunch up the street with his business partner Warner Illk, 622 East Alberta (remember, this is before the Great Renumbering). We’ve pointed out the Queen above at the far left of the Sanborn map detail. In September 1916, Minnie’s widowed husband Jesse L. Lee, who had been living temporarily in Canada, came to Portland to settle the score, tracking down Albert on the afternoon of September 14th where he was sitting on the front steps of the Queen reading a newspaper and waiting for his next delivery. Jesse Lee walked up, asked Albert “Do you know who I am? Well, I’m Mr. Lee,” then fired two blasts from a sawed-off 12-gauge shotgun directly at Albert. The blasts hit Albert in the arm and shoulder, shattered the glass at the bakery, wounded a nearby schoolboy, and terrorized all of Alberta Street. Lee surrendered moments later without incident in a vacant lot at 15th and Wygant, pleased with himself for finally avenging his wife’s death, but disappointed to learn hear he hadn’t killed Albert Gabel. Because this story had so many sensational ingredients, The Oregonian put it all over the front page of the next morning’s edition (it was too late to make the Oregon Journal, which was an afternoon paper). The next day, the Journal ran this photo, showing the late Minnie, Albert, and the front of the Queen Bakery and Lunch, with a white cross applied to the photo in the lower center showing exactly where Albert was sitting when Lee fired upon him. It’s a bit grainy due to microfilming, but you can get an idea for scale. The two one-story storefronts are now gone and the barber pole to the right marks the eastern edge of the brick building that now contains the Alberta Co-op Grocery, 1500 NE Alberta. Jesse was convicted of assault with intent to kill, pleaded guilty, and was sentenced to being banished from Oregon for 10 years (which seems a curiously light sentence for the crime). He moved to Los Angeles, where he worked as a mechanic for several years before his death in 1921. Albert was sentenced too, up to 15 years for involuntary manslaughter, to which he pleaded guilty. He was immediately paroled to the custody of his sister Bertha Gardner on the condition he repay the state $50 for bringing a witness to Oregon for the trial (another light sentence). Albert recovered, though he lost part of his left arm below the elbow. He helped out around the bakery briefly before going into life insurance sales. In the mid 1930s he married and moved to San Luis Obispo, California where he worked as an undertaker’s assistant. In the 1940s, he and wife June moved back to Portland where he worked on the maintenance staff at the Bonneville Power Administration building at Lloyd Center. He died in Portland on April 28, 1954. Father George Gabel, the “muffin man” died in 1924 while actively involved in the shoe business. His wife Mary Gix Gabel, died in June 1931 setting off an inheritance wrestling match among the sibling heirs. 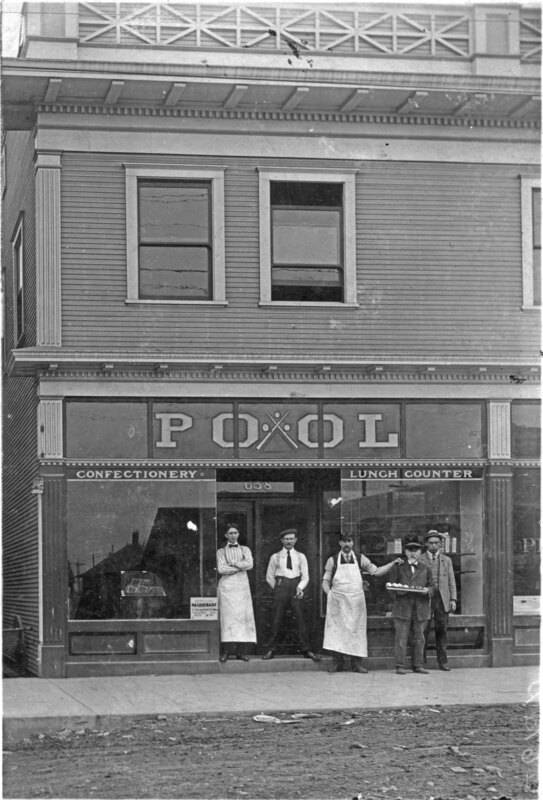 We’ve seen a few other compelling old photos of this area of Alberta Street in the 19-teens that we’re going to continue to pursue, but for now we probably have just one more post in us about Ford’s Pool Hall and then we’ll shift gears a bit. Enjoy these great old photos. 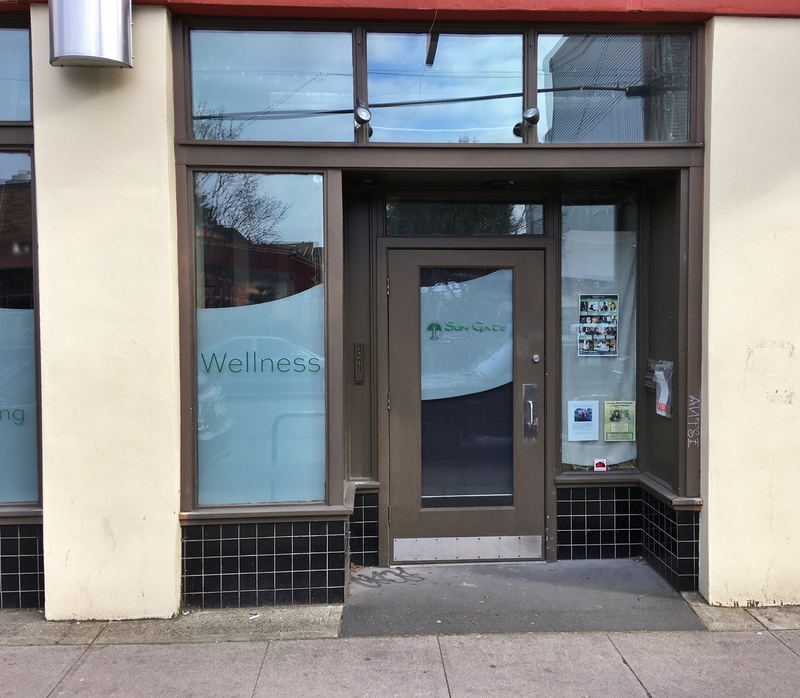 Alberta Street Photo Sleuthing | Found! A friendly AH reader has shared an amazing photo with stories to tell, so have a good detailed look at this (click to enlarge), and then we’ll take it apart and do some sleuthing. There are so many things to think about here. NE 26th and Alberta looking north/northeast, 1909. Photo courtesy of the Gholston Collection, used with permission. 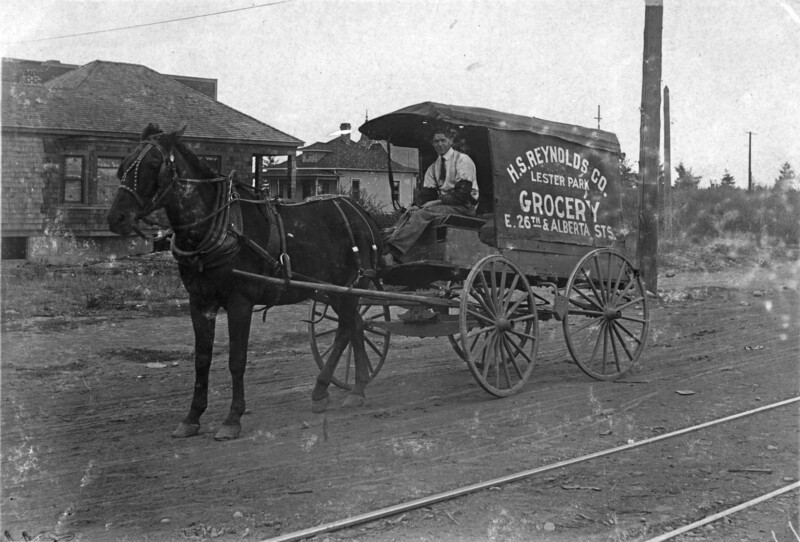 In past entries, we’ve delved into mom and pop groceries, delivery horses and carriages, and the bustling early Alberta Street. Each is present in this picture taken at the corner of NE 26th and Alberta in 1909, three years before the Broadway Bridge was built and at a time when Portland had only 3,540 registered automobiles (so everyone was on foot, horseback or streetcar). Just so we’re clear, Lester Park (the location painted on the side of the wagon) wasn’t a park, it was the name of a plat or subdivision, contained in today’s Concordia neighborhood (just one of multiple plats that make up today’s neighborhood). 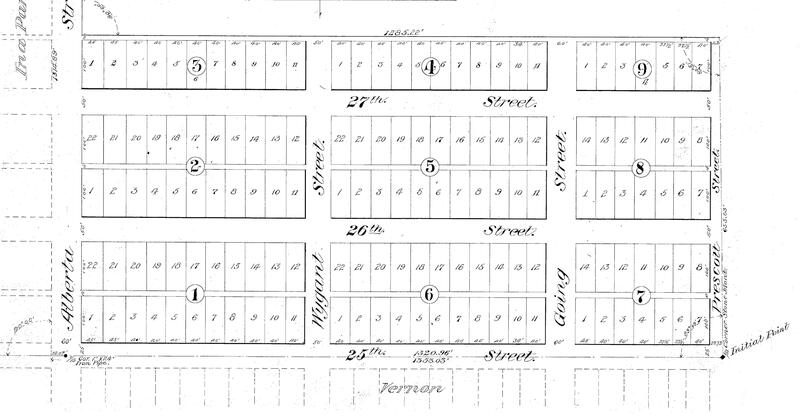 Here’s a look at that plat, filed in 1906 by H.L Chapin of the Arleta Land Company. It’s a compact little rectangle, running from Alberta on the north to Prescott on the south and between NE 25th and NE 27th, 145 total lots. Lester Park Addition Plat, 1906. North is to the left, east is up. The Lester Park Grocery was a dry goods and butcher store that stood in what is today an empty lot just west of the Waffle Window, 2624 NE Alberta. Its original address was 834 Alberta to be exact (remember that all of Portland was renumbered in the 1930s, so this address was before the change). The shop that H.L. Reynolds, his wife Carrie and her daughter called home also included several rooms for the family to live. There are some distinctive houses in the background of this old photo, including a church steeple, which we believe is the building on the southeast corner of NE 27th and Sumner known today as St. Luke Memorial Community Church of God (2700 NE Sumner), but was then the newly constructed United Brethren in Christ Church, built in 1910. Appearing directly in front of the carriage driver in the old photo is a light colored home. 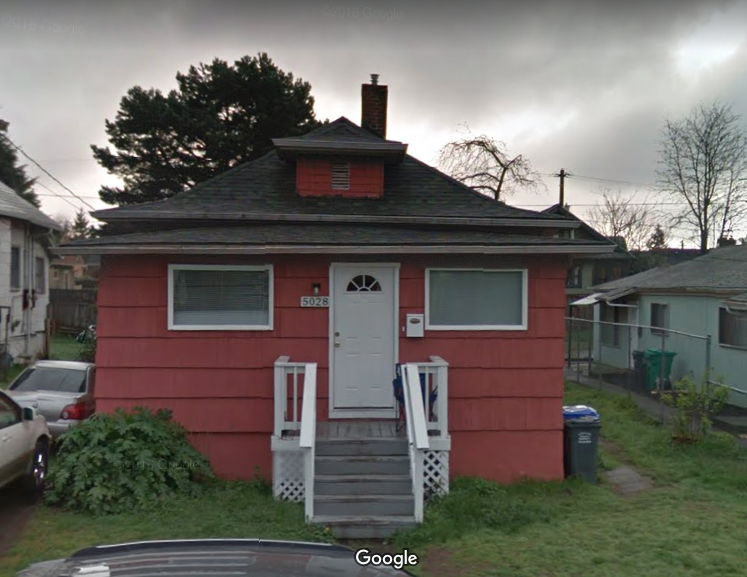 This small hipped-roof house with chimney slightly off center and front dormer is today’s 5028 NE 26th (painted red) with the front porch now enclosed. This house was built in 1906. Here’s a look from Google streetview. See it under all that? Current photo of the small house that appears just above the horse’s rump in the 1909 photograph. Look carefully at the hipped roof, mini dormer on top and slightly off-center chimney. Yep, that’s the same house. Built in 1906 by Mary L. Coger. Thanks to Google Streetview. We know that in 1909 the Alberta Streetcar line (visible in the foreground of the photo) was still just two rails in the dirt; and we know this part of Alberta was not paved until the summer of 1911). We also know that H.L. 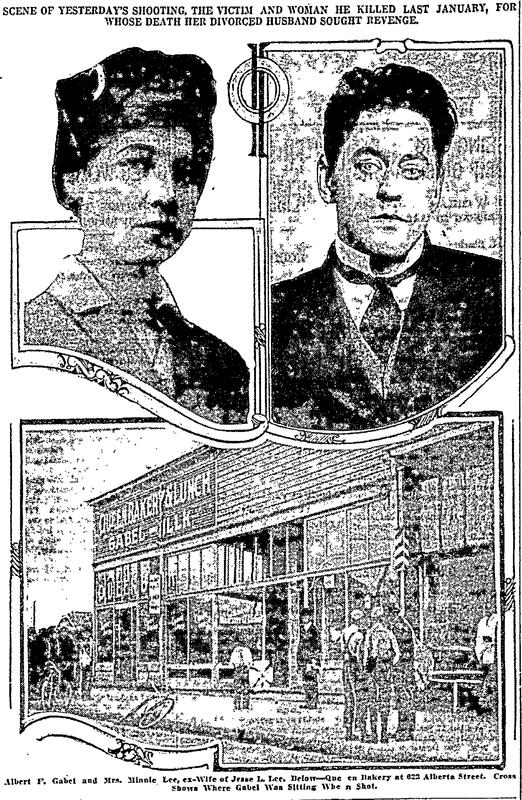 Reynolds, who may well be the man in the photo, was associated with the grocery until about 1910. The 1910 census shows him (age 36) and his wife Carrie living in the residence associated with the shop. That would make the corner of the house you can see just above the horse’s head about where the corner of Mae Ploy Thai Cuisine is today (obviously a different building). Carrie did eventually sell the place and leave town. 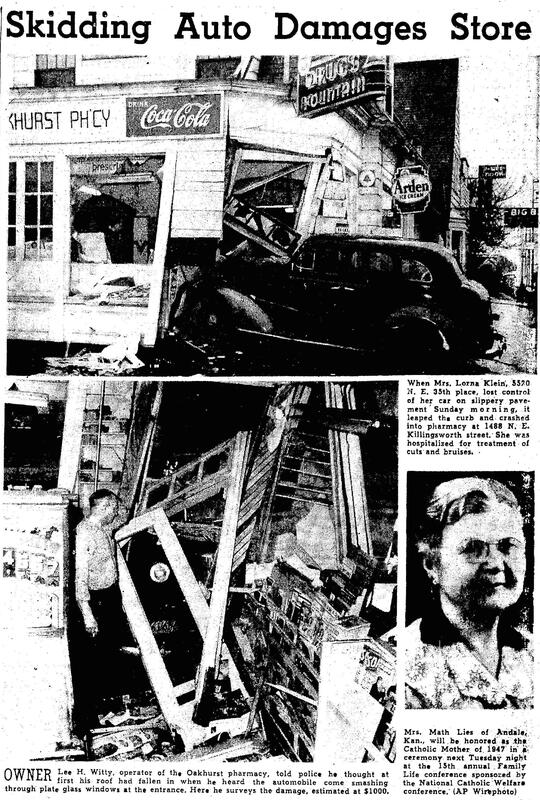 The shop was taken over in 1913 by Mrs. Edna Albertson who ran it as Albertson’s Dry Goods Store (not related to today’s Albertson chain) until 1921 when she was killed in an automobile accident while traveling to Tillamook. How this photo has come down the years–who saved it and why–remains a mystery. This picture is definitely worth 1,000 words. Thanks to Norm Gholston for the opportunity to take a trip back through time. We love this photo and are always looking for views like this that help us think about the past. Ready for a little time travel? The photo was one of several in the 107-year-old brochure that tried to establish the credibility of Alameda Park by referencing the well-established Irvington neighborhood to the south. 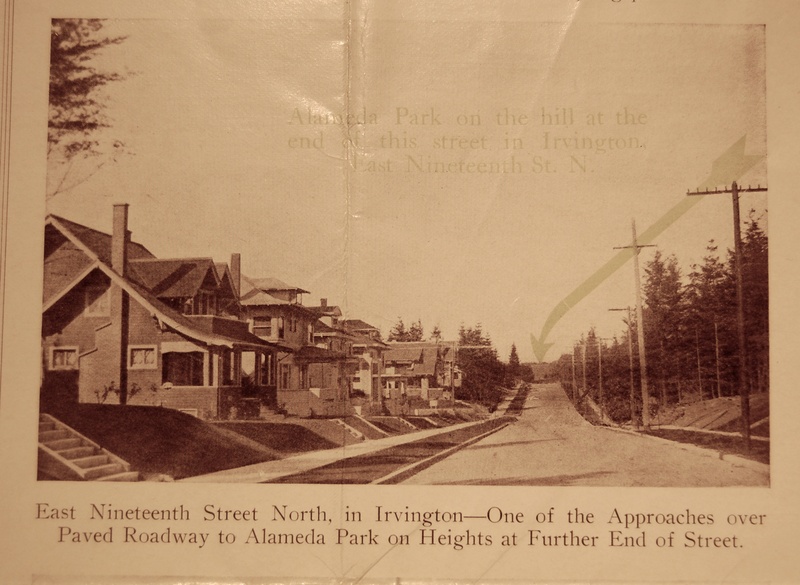 The green text in the old photo is faded, but it’s pointing out that tiny patch of mud and trees at the far north end of this Irvington street view, as if to say: “Alameda…it’s up there.” At the time of its publication in 1910, the Alameda Park neighborhood was still on the drawing board, so boosters shamelessly borrowed Irvington imagery to make Alameda seem like it actually existed. Go check out our post on that brochure which does feature some examples of our favorite views across the open fields of early Alameda Park. A walk around the Pearson dairy farm. A walk along the Broadway streetcar route. A walk around the perimeter of the Alameda Park plat. Hoping you enjoy Christmas past and present this week, and best wishes for the New Year. There’s something about the pride of ownership, of hopefulness, of service that comes through in simple portraits of small business owners standing near an open door, their businesses behind them, wares in the window. We loved the recent photo of John Loyd, arms folded, in front of his butcher shop at Killingsworth and NE 15th. We could look at and wonder about pictures like these all day. 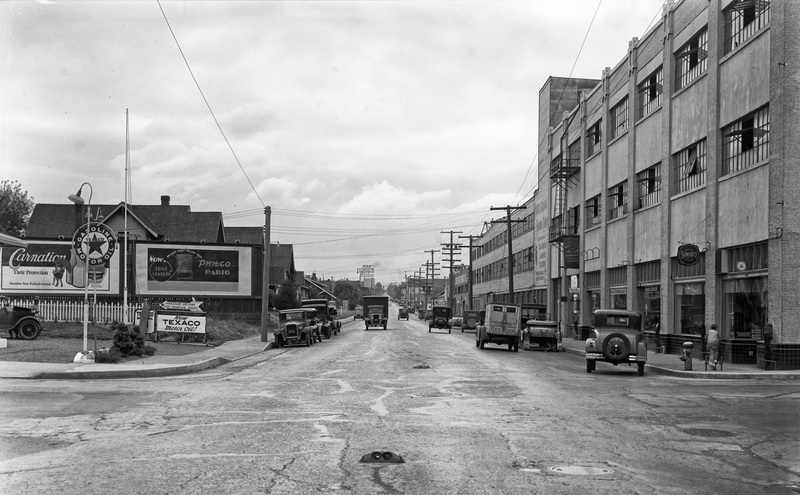 Thanks to the City of Portland Archives, we’ve come across a few more—taken on NE Alberta in the early 1930s, between NE 20th and NE 23rd. The photos came to us without any identification—a challenge we love—so we’ve spent some time this week in research mode and revisiting these places trying to piece together the basics of their stories. Each image is worth taking time with. Click in and have a good look around for the details, sense that pride of ownership, look for clues, watch for the reflections in the window. And think about change, which is so clearly evident on ever-changing Alberta. Here’s what we learned about our smiling shoe repairman. 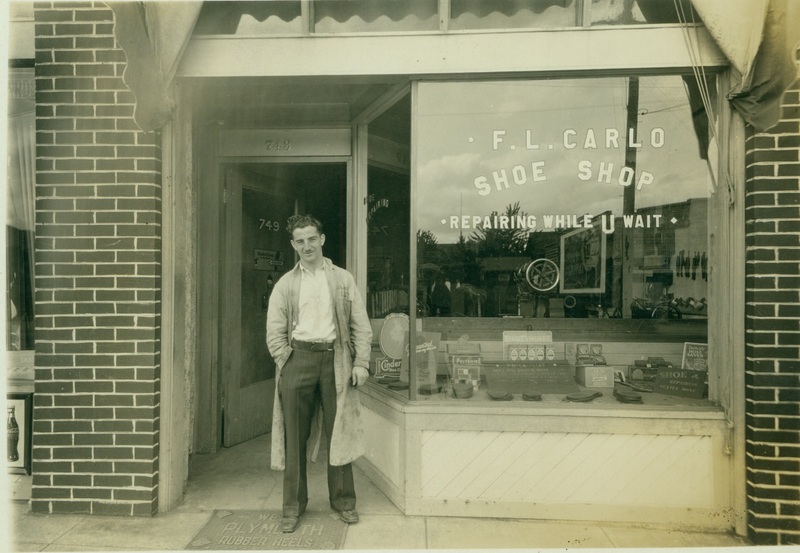 While the name on the window says Carlo, we believe he is actually Ciarlo, one of a family of Ciarlos who ran shoe repair shops in several Portland neighborhoods during these years. Emilio and Mary Ciarlo and their seven children lived in southwest Portland’s Italian neighborhood. The couple immigrated to the US in 1900 from Serra Pedace, Italy (in the south), and Emilio set up a shoe repair shop downtown near SW 2nd and Madison. Two of his sons (all of the kids were born in Oregon) Giuseppe and Vincent, also had shops in Westmoreland and out on SE Foster. City directories for the early 1930s list this Alberta address as “Emilio Ciarlo,” but here’s what we think: Emilio helped set up his younger sons here on Alberta as they got their start. We don’t think this is Emilio: in 1930 he was 57 years old, plus his immigration papers indicate he was missing most of his left hand. Our guess is that this is son Louis Ciarlo (age 21 in the 1930 Census), who along with his 19 year-old brother Frank were just starting out in the shoe repair business. Our guess is that “F L Carlo” is likely Frank and Louis Ciarlo. It was not uncommon for immigrants of the day to simplify or “Americanize” their names. In fact, Giuseppe’s shop in Westmoreland was called American Shoe Repair. The “rest of the story” on this is that their business operated at this address from 1930-1932, but the storefront was vacant after that until the late 1930s. Later city directories show Louis as a driver and Frank as a machinist, though brothers Giuseppe and Vincent stayed with shoe repair throughout their lives. An unknown in the midst of this and the other two moments in time is the motive and identity of the photographer. Was he walking up the street taking pictures for a small fee? Was he as fascinated as we are in the stories and adventures of the small business owners? Was he thinking about the future? Look carefully in the reflection of the window at Ciarlo’s and you can see the head, cap, white collar and shoulder of our photographer (you can also see a billboard reflected from across the street). Hmm. 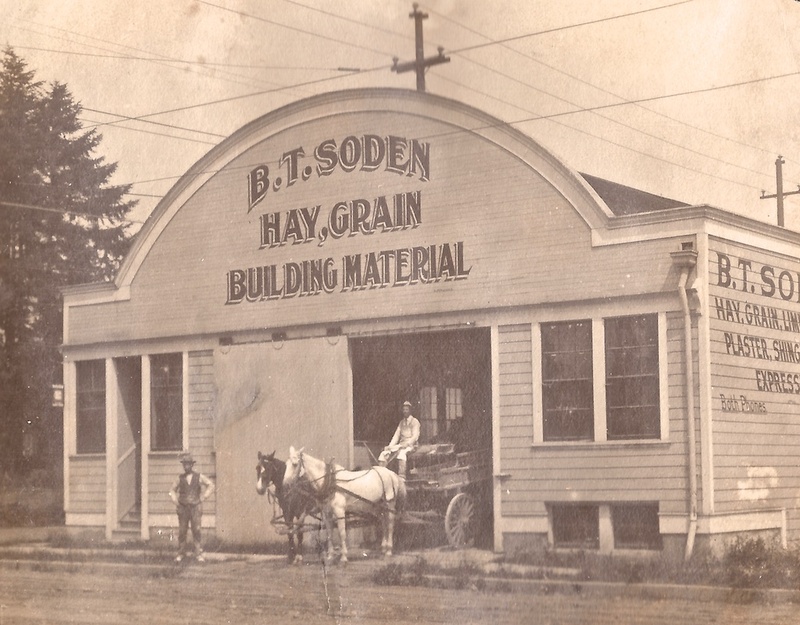 Halver B. Olsen and his wife Marie immigrated to the US from Norway in 1902 and lived in Minnesota before moving to the Portland area in 1926. When this picture was taken, Marie had recently died and H.B. had moved from the upstairs apartment attached to this business where the two lived into a rented room in a family house just up the block. He was 52 years old in 1930, no children. H.B. ran his watch and jewelry repair at this address until 1935 and then he disappears from the city directories. That excerpt, by the way, is taken from comments posted on an outstanding blog we follow and recommend called Vintage Portland, which is run by the City of Portland Archives and Record Center and regularly features old photos drawn from the city’s collection. This one appeared there in November 2013. Of all three photographs here, this building façade is closest to its original shape, at least for the moment. When we dropped by recently, construction was underway. Whenever we see chain link fence out in front of an old building, we get nervous. This original old photo came with little identification, simply the “Red and White Store, 718 Alberta.” We’ve determined it was actually known as the Irving Market and Grocery during its short life, operated by David and May Irving, who we suspect are the couple to the right. His military records—he was a WW I soldier—indicate he was six feet tall. David was born in Canada and May was from England. Did they meet during the war? 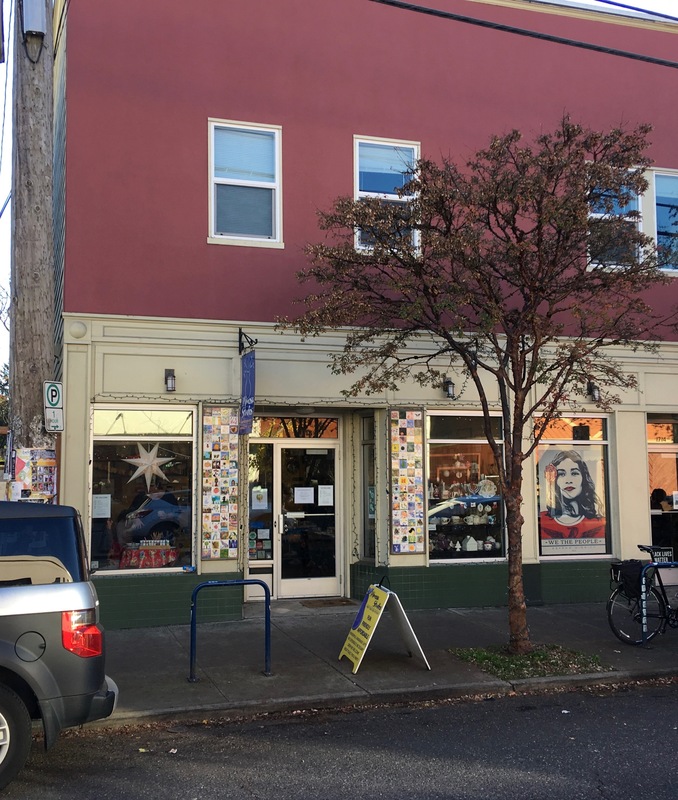 In the 1920s, they ran several small grocery businesses in Portland. The couple owned a home not too far away in Rose City Park. 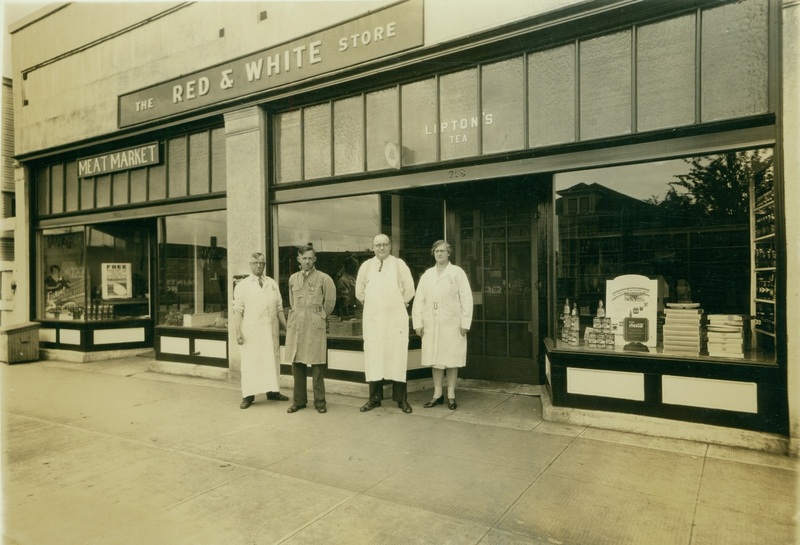 We’ll remember from our recent post about Gwaltney’s Red and White Store on Killingsworth that these independently owned stores were everywhere. The Red and White franchise enabled Mom and Pop businesses like the Irvings to set up shop by buying Red and White branded merchandise, marketing materials and even store shelving. In the mid 1930s, there were 6,700 Red and White markets nationally. We had several in the neighborhood. This building on Alberta was vacant in 1930 before David and May were on the scene, and the Irving Market and Grocery’s life was short: by 1933, the building was vacant again and remained so until 1937 when the Ray-o-Sun Grocery moved in, and David had gone to work for a large wholesale grocery company. The subject of small neighborhood grocery stores, as AH readers will know, is close to our heart. We’ve taken an interest in understanding the life stories of local Mom and Pop grocery stores in the neighborhood. Understanding the ecosystem of small grocery businesses at the time also points to how shopping trends, the larger economy and day-to-day life in the neighborhood have changed over the years. 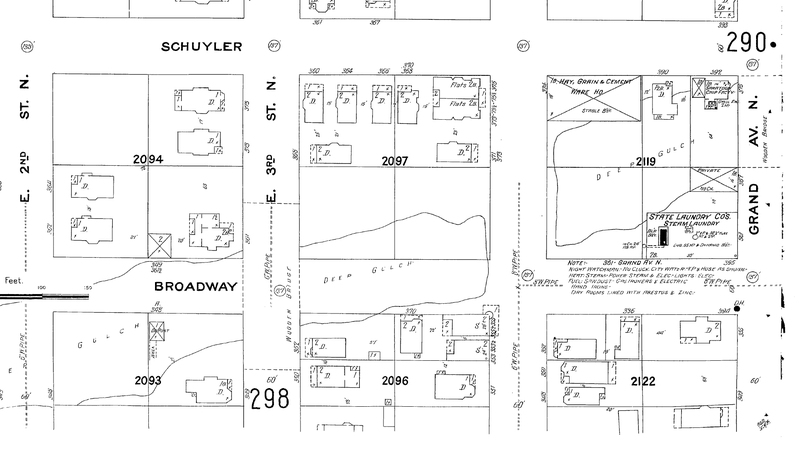 In 1930, we count 208 businesses along Alberta between MLK and NE 33rd Avenue. We’ve gone back through city directories of the late 1920s and early 1930s and have found a vacancy rate for any one year between 15-20 percent, highest in the early 1930s. An analysis like this also turns up some interesting trends. Here’s a listing of the types of businesses on Alberta in the early 1930s, in descending order by type: 15 grocery stores; nine beauty shops or barbers; seven shoe repair shops; seven tailors or sewing shops; four butchers; four bakers; four pharmacies; four filling stations; four variety stores; four sweet shops; three hardware shops; three auto repair garages; three dentists; three furniture stores; two doctors; two theaters (including the Alameda Theater, which we’ve written about here on the blog); two radio shops; two restaurants; one ice delivery station; and a hodge podge of single shop fronts for plumbers, electricians, painters, real estate agents, sign shops, pool halls, watchmakers (our Halver B. Olsen), hat shop and others, including quite a few residences. And a busy streetcar line connected these businesses with local residences and beyond. There’s some perspective for you. Radio, ice, hardware? 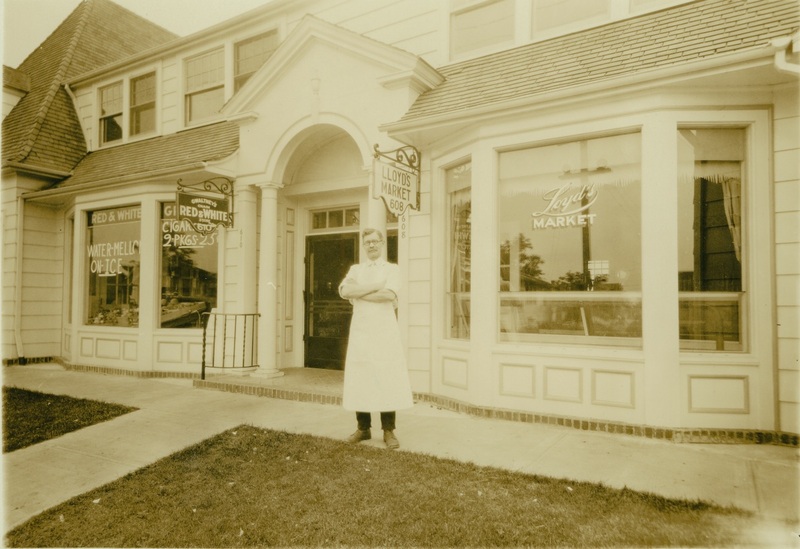 We came across a great old photo recently of a proud apron-clad businessman standing, arms crossed, in front of his market at the corner of NE 15th and Killingsworth. It’s a photo worth having a look at. We’ve been staring at it for a while to puzzle through some of its riddles. First, there is no identification. Who is this proud man? Second, there’s a spelling conflict: is it Loyd’s (as the window suggests) or Lloyd’s (as the shingle suggests), and how did that happen? What did Loyd’s sell? And when you really look at the picture you understand it’s actually two businesses: Gwaltney’s Red and White Market where the watermelons and cigarettes are for sale, and Loyd’s (or Lloyd’s, depending on which sign you read). Can you hear the spring in the screen door when it opens, and the door smacking back into the frame as it closes? 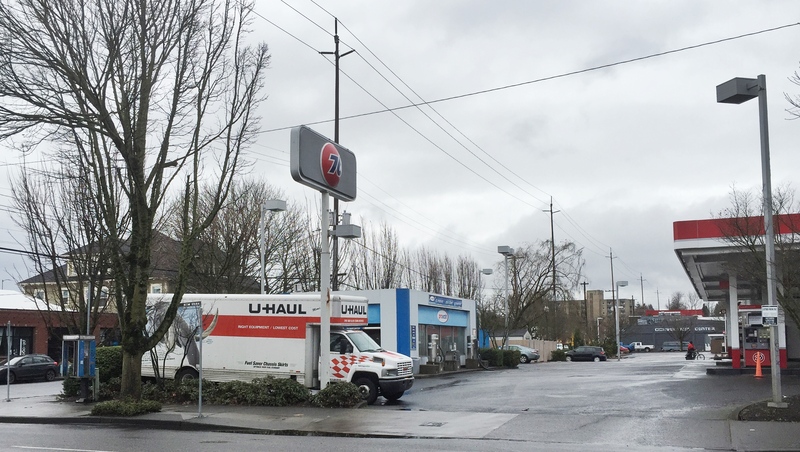 We do know where it is: the southwest corner of Killingsworth and 15th. Loyd’s was 608 and Gwaltney’s was 610. After some research, it became clear to us that the main entrance to Gwaltney’s was off the picture to the left, at the corner. More on that in a moment. These addresses translate to 1478 Killingsworth today. Remember, all of Portland was readdressed in 1931, so we know this photo was taken before that. We’re guessing 1929-1930. Built in 1927, the building still stands. A look back through permit history shows many chapters and changes: market, pharmacy, restaurant, tavern, pool hall, rented rooms upstairs, and now office space. Next is the question of who this gentleman is. 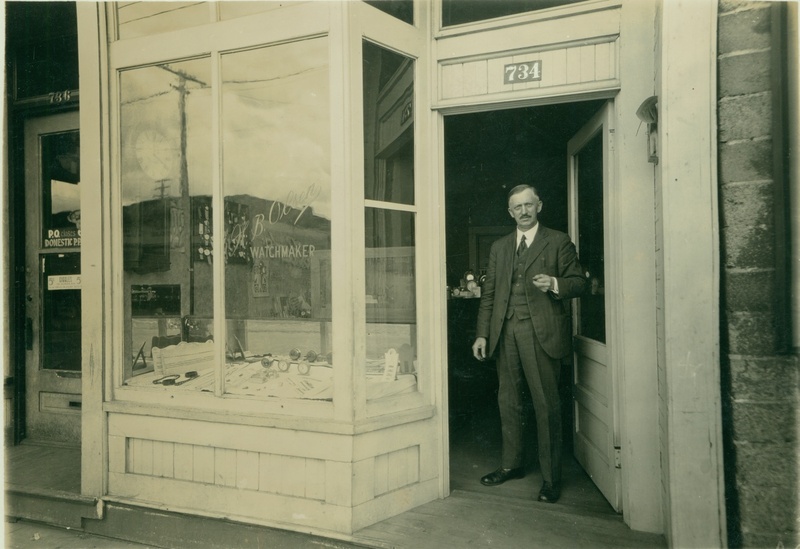 We believe this is actually Mr. Loyd in front of his store, not Mr. Gwaltney (who would have been posing in front of his own front door somewhere off the picture to the left). With the help of the Polk City Directories, census records and a few other genealogy tools, we believe this man is John F. Loyd (only one “L”). From 1929-1939 he ran a meat market at this address. For some of those years his son Clarence helped out in the shop. Loyd lived on Dupont Street near the Broadway Bridge (now gone under the Portland Public Schools building–Dupont no longer exists) with his wife Alma and children Clarence, Ruby and Lester. He was a WW1 veteran. John and Alma were born in Sweden and immigrated to the US in 1900. Willis H. Gwaltney was the shopkeeper at the Red and White Store, off to the left. Gwaltney and his wife Martha lived just around the corner on NE 16th. He spent a career in the grocery business, his last assignment being at the Kienows on SE 39th and Lincoln. In the 1930s, Red and White markets were everywhere. Each was independently owned: shopkeepers could buy Red and White branded merchandise, marketing materials and even store shelving. In the mid 1930s, there were 6,700 Red and White markets nationally. We had several in the neighborhood…more on that in a future post. Gwaltney’s shows up in the Polk City Directory at this address from 1929-1933, when Willis moved on, likely a victim of the changing economy. 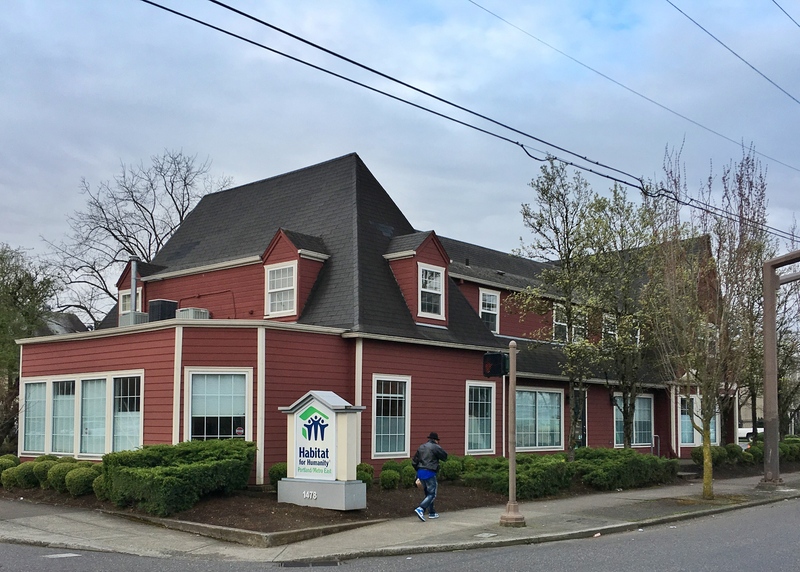 While out taking pictures of this building, which in 2017 is the home of Portland/East Metro Habitat for Humanity, we decided to knock on the door and share this picture with the current occupants. The very friendly Tim, who was at the front desk there, was welcoming and excited to see Mr. Loyd. Tim wanted to share an old picture of his own and took us into the back room to see a large format framed photo of the building hanging on the wall, shown below. The timeframe for this one is a bit later. 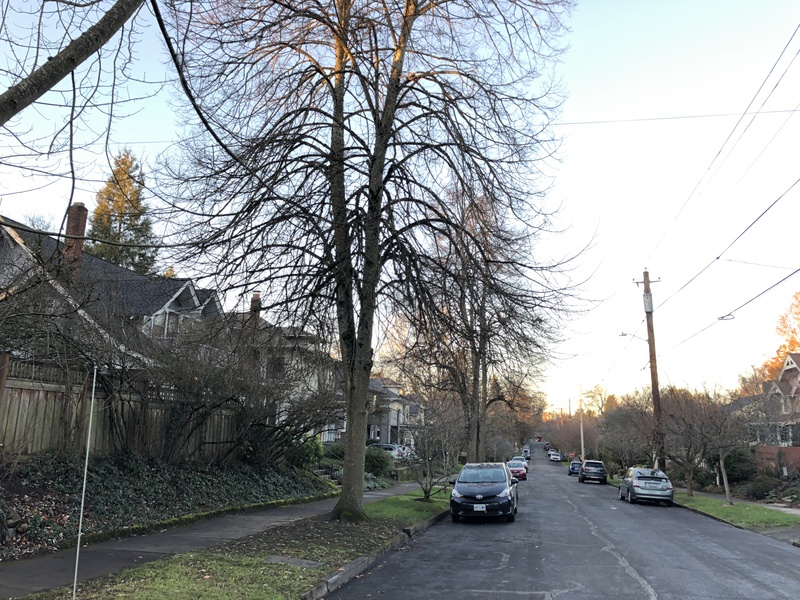 Oakhurst, by the way, is the name of the platted addition just west of the Vernon area between Killingsworth and Ainsworth from 14th to 19th, originally platted in 1892. We’re betting that name has faded away like so many of Portland’s other plats. Have you ever heard someone talking about Oakhurst? We haven’t. How much longer will this building last? Good question. It has certainly seen its share of change. Uncovering its story, like all the research we do, is about as close to time travel as we can get. 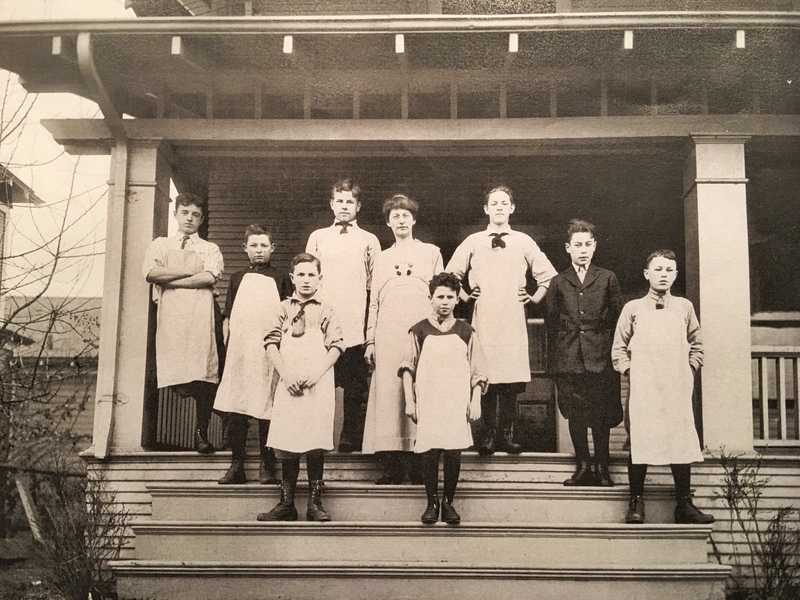 Scattered and unidentified in File 1856 at the Oregon Historical Society are pictures of young people preparing food in an old house kitchen and lined up on a front porch looking very determined in their white aprons. The pictures are piled into a dog-eared manila folder containing random old photos of schools in north and northeast Portland, so at first glance they seemed out of place. Why was a house in the school folder? The photos did have the name “Vernon” written on the back, but they were clearly of a house, not a school. We made copies of these photos anyway and kept on in our search for information on the old Vernon School. That’s one of our rules of research: you never know how all the parts might fit together, so keep an open mind and gather up the pieces because eventually they might make sense, and you’ll need them to complete the puzzle. 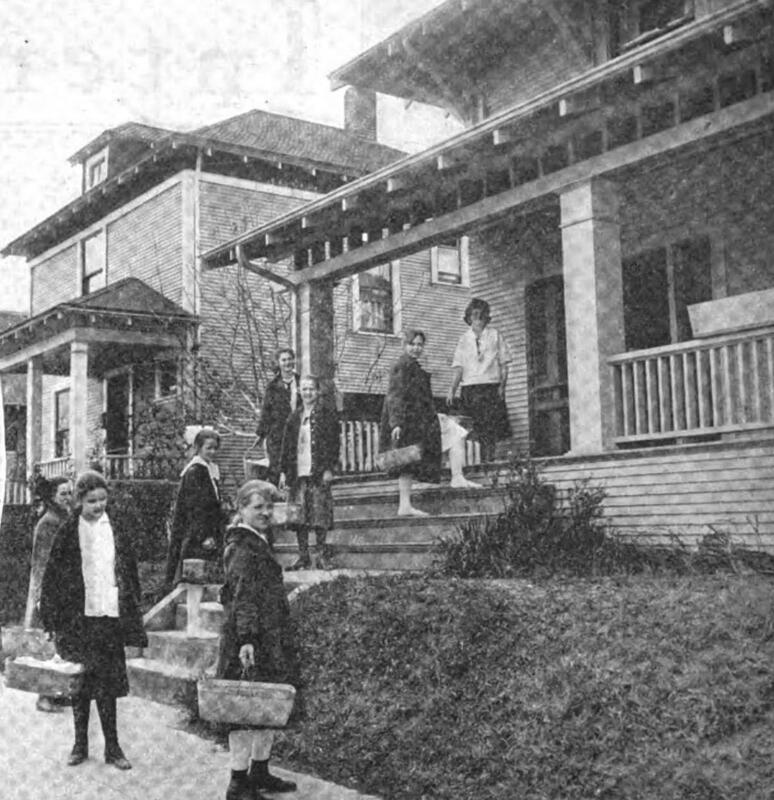 As we’ve learned more about old Vernon School—which occupied the entire block bounded by NE 22nd and NE 23rd, Wygant and Going from 1907-1932—we found references to two different nearby houses, rented by the school board at different times, that provided a learning laboratory for “domestic science.” These insights helped us make sense of the photos. Launched by Vernon School Principal William Parker, the program started in 1914 in a rented house at 4715 NE 24th (rent was $18 per month) where it ran under the supervision of Mrs. Caroline Redding. 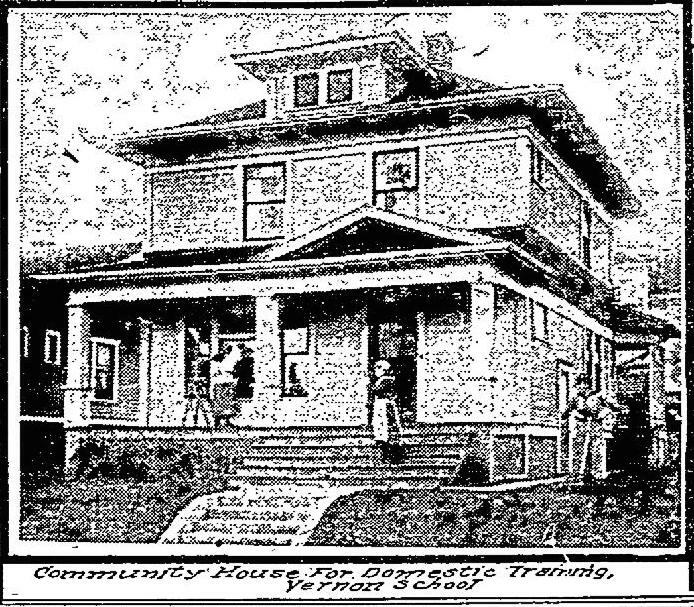 References in The Oregonian and a handful of national magazines referred to it then as the Vernon Community House. In 1917, the program shifted to a different teacher—Mrs. Lois Swafford—and a different house, this one also rented, at 4545 NE 21st. This house was referred to as the Vernon Practice House. Regardless of which house or what it was called, Vernon’s community-house-practice-house was a pretty resourceful little institution. 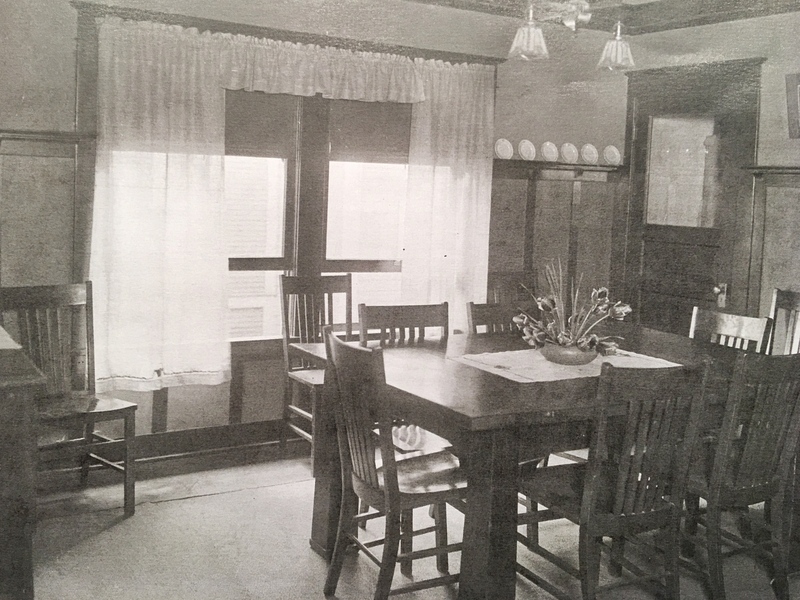 Students built the furniture, dug, planted and weeded the vegetable garden, made the drapes, sheets and linens, planned and made the meals, planned household budgets and hosted dozens of teas and gatherings to practice their domestic arts. They developed systematic approaches to cleaning and maintenance. Principal Parker dubbed the insight and experience this created as “homecraft,” the art of running a household. Students had the responsibilities and the learning rewards of figuring out how to run a two-story, six-room house; to practice at some life skills that might come in handy down the line. 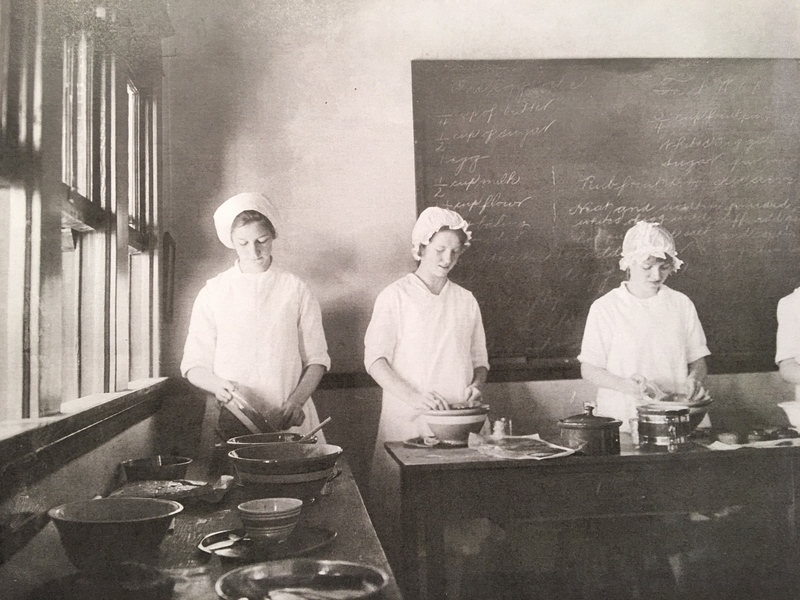 Over a period of four years between 1914-1918, old Vernon School was a kind of educational mecca visited by leading lights in the education world and the national press to see what this learning-by-doing house was all about. 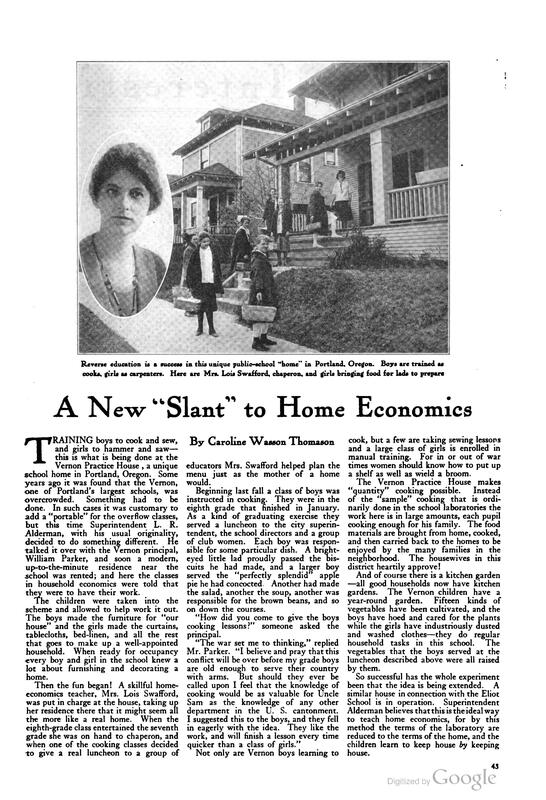 During those years, the neighborhood had an impressive list of visitors that included the head of the Education Department at Harvard University; Ladies Home Journal magazine; Sunset magazine; scholarly education journals; The Country Gentleman, a national-circulation magazine targeted at rural homeowners. 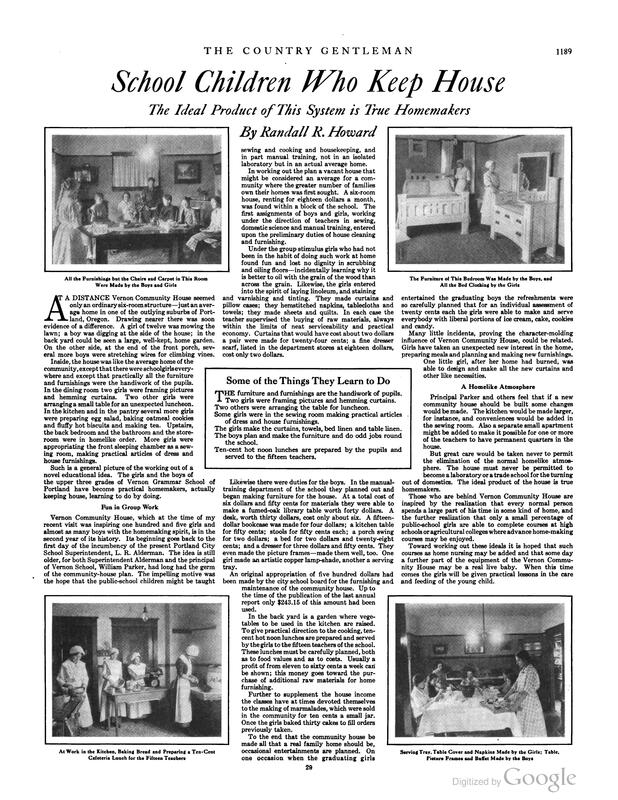 Here’s a July 1915 article from The Country Gentleman, that describes the Vernon Community House. Click the image to enlarge. Below, an article from Sunset Magazine in October 1918 tells pretty much the same story of the program. Featured in the photo is the Vernon Practice House (the second of the two houses) at NE 21st and Going, which operated after 1917 under the leadership of Mrs. Lois Swafford (inset). Click the image below to enlarge. Even though old Vernon School has been gone now for 85 years, we wondered how both houses were faring and if their residents had any inkling of the former role these houses played in the neighborhood. So with pictures in hand, we set out to find them. We visited briefly with the homeowner here on NE 24th, who has lived in this house for 20 years. He had no idea his house was once part of a school program or, for that matter, that there had been a school just one block over. Most people we talked to, and those we’ve heard from since posting our story on Old Vernon, had no idea of the school’s former presence in the neighborhood. Continuing on our hunt for old houses, we found and knocked on the front door at the second Vernon Practice House, where we met homeowners Ann Gravatt and Brad Ouderkirk, who were not aware of the home’s history but were interested to learn more. Again, no indications from their knowledge of the house that it was long ago the focus of so much attention. The second Vernon School Practice House (after 1917). Detail from October 1918 Sunset Magazine (above), and today (below). 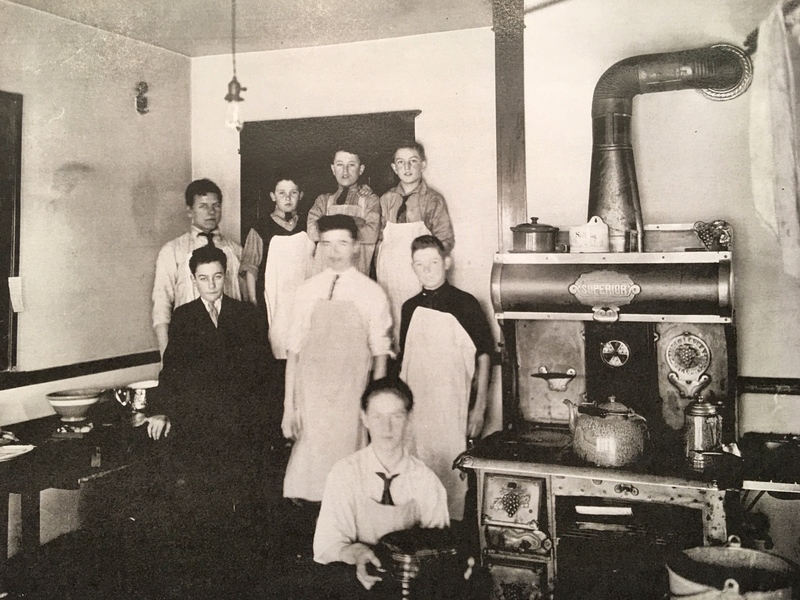 Written on the back of this photo: “Vernon School boys, Portland, Oregon, who have been learning ‘fantastic cookery. '” Courtesy Oregon Historical Society, file #1856. Our best guess is that these photos were taken by Portland Public Schools in fall 1917 or spring 1918. When the current homeowners saw this photo: “Yes, that is definitely our dining room.” Courtesy of Oregon Historical Society, file #1856. After several feature-length stories in The Oregonian in the mid 19-teens, and many blurbs promoting upcoming community teas, fundraisers and social events at the house (all catered and staffed by eager students), newspaper references to the house stop in late 1918. No clues in the archives, and no one to ask about what it all meant or how the Vernon Practice House ended. Did Mrs. Swafford leave? Did the return of soldiers at the close of World War I swamp the rental market and return the practice house into actual use? We know that Principal Parker, a key leader of the effort, was at Old Vernon until 1920 when he was transferred to the Albina Homestead School at NE Beech and NE Mallory streets. Did he take the program with him when he left? One of the great joys of our research is finding the unknown—more properly the long forgotten—in the midst of the known. Photos, memories, documents and stories from the past add new understanding to places we know (or think we know), and often bring a hint of the familiar: the profile of the ridgeline on the horizon, the curve of a street, the form of a building we recognize. Sometimes these clues from the past are unreconcilable with the landscape we know today. 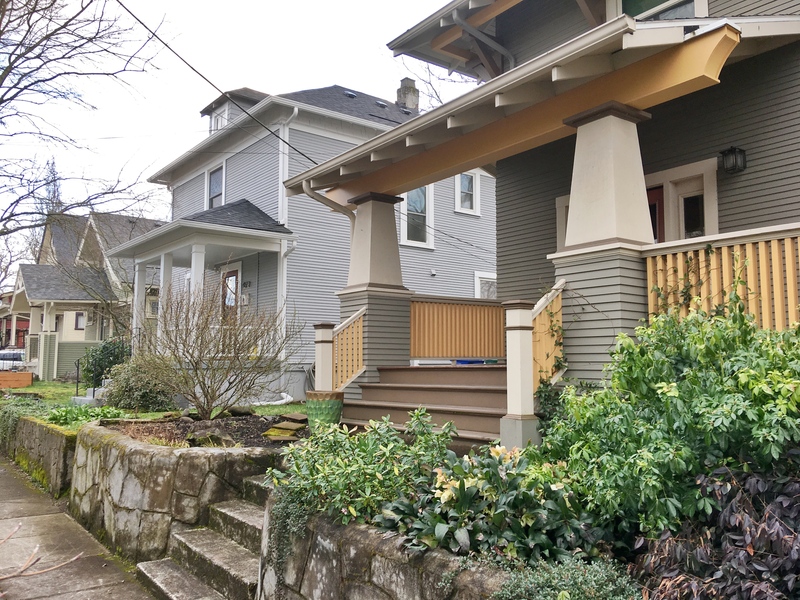 In the world of Northeast Portland neighborhoods, pretty much anything after 1910 will carry a hint of the familiar. Turn back the clock a bit further and those hints are harder to detect. Case in point: this Sanborn fire insurance underwriting map from 1909 of the Eliot neighborhood, showing the vicinity of the busy intersection at Grand and Broadway that we all know. Or think we know. Have a good look and pay attention to the location and extent of the gully shown as Deep Gulch, the wooden bridges, the buildings up on posts, the row of houses with their bay windows all to the side. Check out the State Laundry Company building too, and the note about the night watchman. (If you don’t know about Sanborn maps—which were used for fire insurance underwriting—be sure to check out our post on the topic). Everything in this frame from 1909 is absolutely gone today—the gully, the buildings even the streets which have been widened—and most of us speed through here (being careful about the red-light cameras) on our way somewhere else. Below is a modern view of that intersection. Thanks to Google Maps. Click the thumbnail above for the full photo. Ready for an even closer look? This is the fun part where we get to try to imagine the landscape that once was, and how different it is today. As you study this photo, be sure to check out the detail: the awning style shutters; the orderly clapboard and fish-scale siding; the beautiful shingle roof; the decorative round gable end ornaments; the family members at each level; the gulch out back. The picket fence in the left foreground is running north-south along the edge of NE 3rd. The double gable end faces NE 3rd, so this view is looking off to the south/southwest at the corner of NE 3rd and Broadway. Home of B.T. and Cora Soden, NE 3rd and Broadway. Photo courtesy of Bob Elston. 237 NE Broadway in January 2016. We’re able to feed this imagination thanks to fourth-generation Northeast Portland resident Bob Elston, great-grandson of Bartholomew and Cora Soden, who recently shared these and other family photos that got us to wondering about this part of the neighborhood, and to haunting these blocks ourselves in order to take a good look. Thanks Bob. Fast forward a few years and a slightly different angle at the Soden place, this time looking west/northwest showing the barn out back, which is depicted in the 1905 Sanborn map. Note the same wooden bridge on Northeast 3rd over Deep Gulch, which keys the building into the northwest corner of that intersection. The dip of the gulch is still visible off to the left. NE 3rd and Broadway, looking west in the late 1890s. Photo courtesy of Bob Elston. 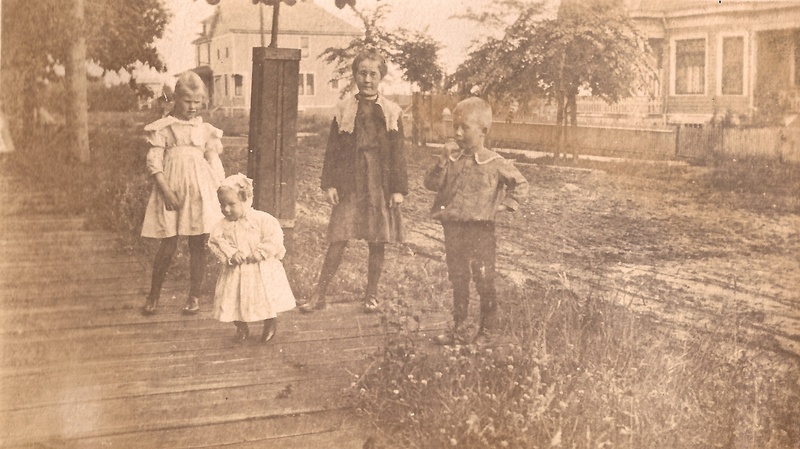 Frances, Willard, Mildred and Lester Soden, in front of the house on NE 3rd, 1898. This view is looking north on 3rd. Photo courtesy of Bob Elston. The southeast corner of NE 3rd and Union, about 1905. Photo courtesy of Bob Elston. Bart was born in Australia in 1849, came to Oregon as a young boy, and grew up in rural Polk County. 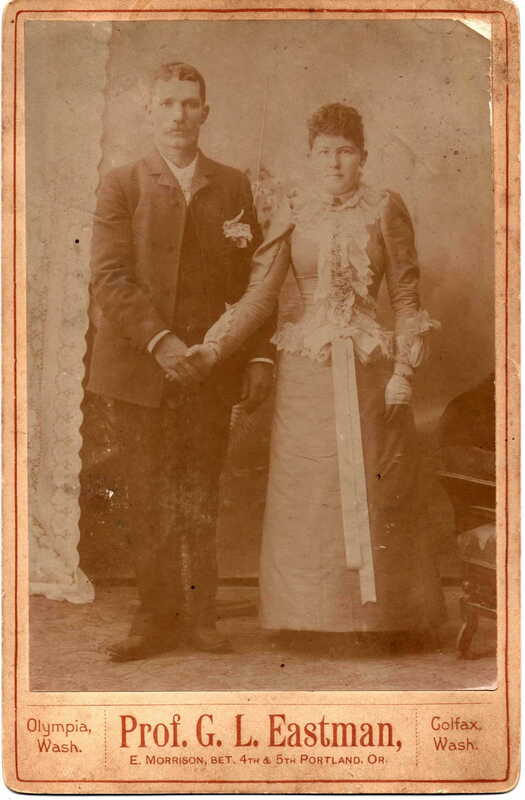 He earned a degree from the Oregon Agricultural College in 1879, tried his hand at teaching for a while, and eventually moved to Portland in the 1880s where he married Cora Wells, 16 years his junior. The couple built the house and business we’ve been looking at here, raised a family of two sons and two daughters, and were active in Portland society. Bart died in 1926. Cora lived until 1950. Both parents and several of the children are buried in the family plot at Portland’s historic Lone Fir Cemetery. We’ve recently come across a memoir by a Portlander who grew up a couple streets over about the same time as the young Sodens. Stay tuned for his observations, which will continue to help us bring this long lost landscape back to life.